The scarf measures 13 x 60. It has great texture in shades of beige, brown and orange. This necklace measures 21 inches clasp to clasp with a 4 inch pendant. It is made up of a total of 7 strands. 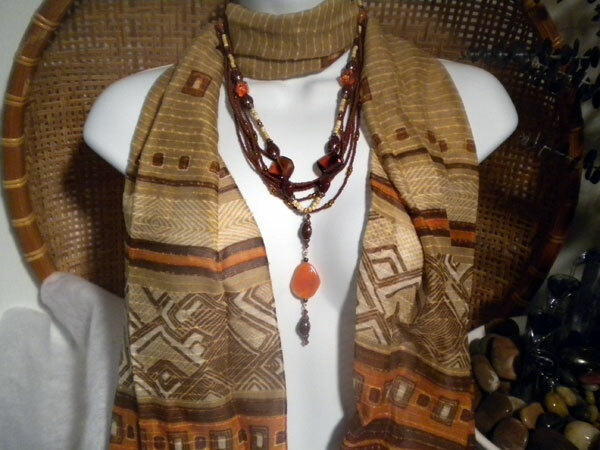 The focal strand has varied brown glass beads, orange acrylic beads and ivory seed beads while the remaining strands are mostly small brown seed beads. It's a beautiful combination whose color is much warmer than the photo depicts. The set would look great with anything in beige, taupe, brown or orange.